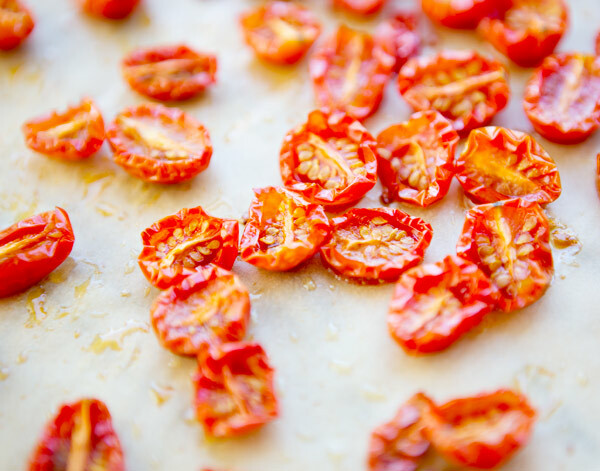 – Clean and halve one pint of cherry tomatoes and toss in a splash of extra virgin olive oil until evenly coated. Sprinkle with a generous dash of sea salt and spread on a cookie sheet, seed side up. – In a large mixing bowl combine noodles with two tablespoons of pesto (more to your preference) and mix well. 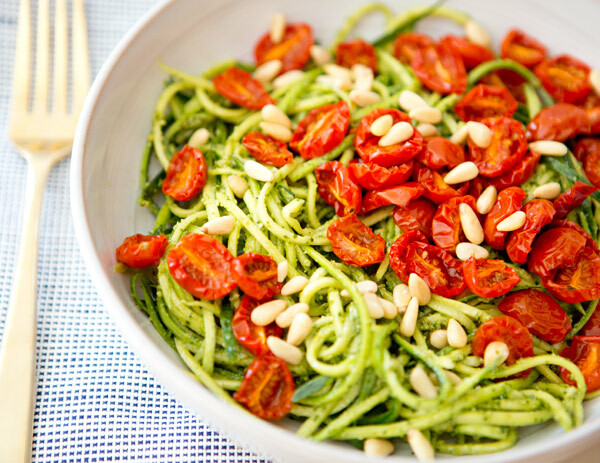 – To serve: divide noodles into two bowls, top with cherry tomatoes, sprinkle with pine nuts and serve. This looks so yummy! I want to see if I can get my bf to eat vegan! This dish looks absolutely stunning! An eye-catcher. This looks so delicious! I've never tried the zucchini noodle-thing but this recipe makes me want to try this!! Wow, beautiful! I love the look of those roasted tomatoes, and anything with pesto is a sure favourite for me. I literally have cherry tomatoes slow-roasting in the oven right now!! I do them at night to avoid the heat. 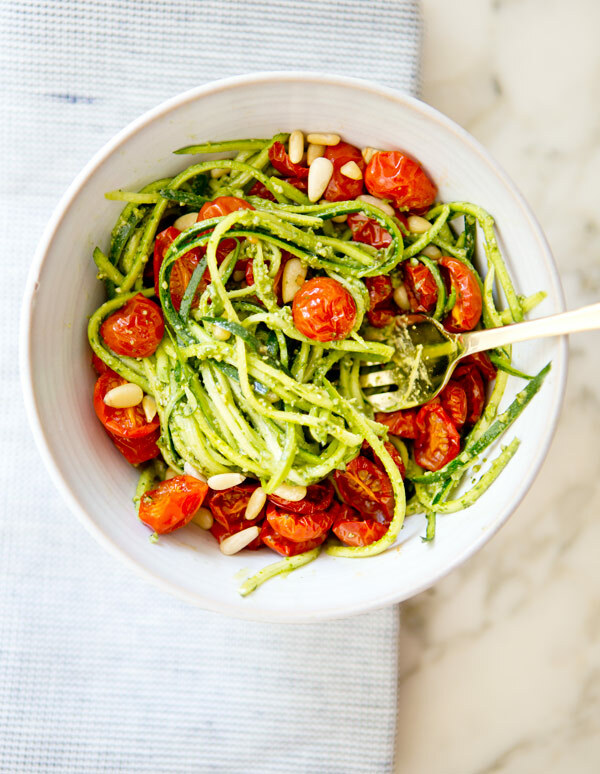 Zucchini is one of my favorite vegetables, and I can only imagine how delicious it tastes with roasted tomatoes and pesto – yum! I'm planning on refrigerating overnight and eating it for work tomorrow, would you recommend mixing the pesto into the dish tomorrow instead of overnight? This looks so yummy! As a vegetarian I've been trying to up my vegetables and reduce my reliance on heavy carbs lately – this is the perfect answer! Yum! Love zucchini, so this would be a fantastic recipe for me to try. So healthy and fresh! I purchased one at Bed bath and Beyond for less than $13 with my 20% off coupon. It’s the Veggetti as seen on TV. Very easy to use. Just turn the zucchini in the hole and it juliennes like magic. I was using a julienne vegetable peeler begone this and it hurt my fingers. It also took too long. 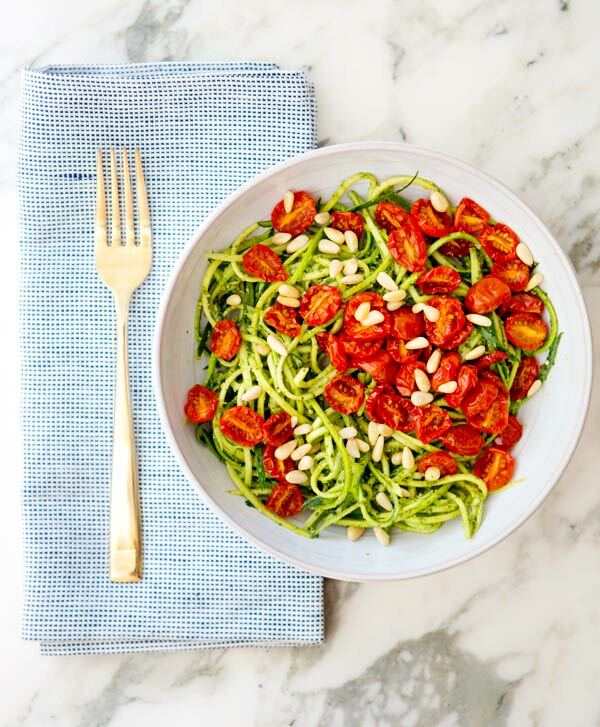 Zucchini noodles is something I have yet to try but always wanted to! This looks and sounds amazing, Sarah! I'll definitely be trying this healthy mid-week meal. Looks so satisfying! I did saut the noodles for a few minutes before we ate, but didn't change anything else and it was delicious! The noodles still had some crunch to them, but I liked them a bit more warm. Thanks! I’m going to do the same for 4 mins. Just made this. So good! Thanks! So pretty i love the marriage of these two pretty colours. Me looking out for a good brand of julienne peeler for some time. Hey.. Thanks for that recipe of zucchini noodles… I really loved the way you presented it… felt like eating it.. I am a BIG fan of maggi . But I like Maggi cup noodles more as it is very easy to cook. You just need to add hot water and your delicious Maggi noodles is ready to eat in 5 minutes!!! But whenever I get time I used to cook noodles at home itself. The recipe looks amazing! But im still not sure about eating things raw, so can i boil them or would that ruin everything ?